Normally, I kick back on Fridays with a drink. But last week, I chose something a little different. Yoga. I looked around nervously at the 24 Nirvana-seeking faces. Nothing to be afraid of, I reassured myself. I am Indian. Yoga runs in my blood. And then he wafted in. A small, bearded bloke in white linen and oversize beads. He turned on Irish-Sanskrit trance music meets Hed Kandi chillout. And lit some incense. The class, he stated in a low voice, is a meditational, spiritual awakening of the inner consciousness of our self. We are going to balance our left brain with our right brain, finally centering ourselves with our highest awareness of our being. This sounds complicated. Can I go home? Balance yourself on one leg, raise your opposite arm and start flapping. Soar until you reach the peak of self transformation. Unleash your creativity. I paid to do a chicken impression? When they started singing abut peace and love, I finally clocked off and started focusing my inner self on Smirnoff and Bhapa Doi, delicious Bengali cheesecake flavoured with saffron and cardamom. 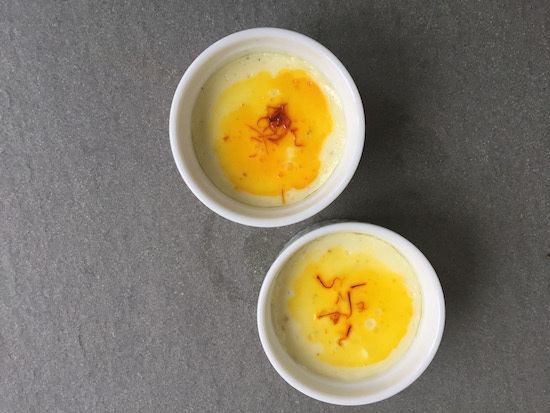 This is an easy bhapa doi recipe, oven baked in a bain marie with easily sourced ingredients. The flow of power in my home is all about moving from living room to kitchen. Transferring the contents of a deliciously sweet and creamy Bhapa doi pot to the mouth. Knowing it took all of 20 minutes to make. And washing it down with a stiff drink. Next time I’ll stick to what works best. Preheat the oven to 190 Degrees Centigrade. Put the cardamoms in a large shallow baking tray in the oven for about five minutes. Heat the milk with the saffron strands in the microwave fr 10 seconds and leave until later. In the meantime, mix the yogurt and condensed milk together until smooth. Crush the cardamoms and stir them into the cheesecake mix. Fill six little ramekins or a pyrex baking dish with the doi or yoghurt. Place in the large, shallow baking tray. Fill this tray with enough hot water to come half way up to the ramekins/dish. Then carefully place the whole lot in the oven for 10 minutes. After this time, spoon a couple of saffron strands and a little bit of the golden milk on top of the yoghurt. Keep cooking for another five minutes until the cheesecake has set. A fork inserted should come out clean. Leave to sit for 10 minutes and then refridgerate for later. This is a delicious low fat desert after a full meal – only 6 grams of fat per serving. PS = This is my first entry to Sandeepa‘s Bengali food event. I am tripping over with excitement about showcasing the food I grew up with in Kolkata!! Having bought the Calcutta Cookbook recently, I’m quite excited about the RCI Bengal event, trying out whatever vegetarian recipes I can from the book..
Yash – Thanks for leaving a comment on Youtube. Although it took me a while to figure out what Vlog meant!! Nandita – I have that one too. It’s great. Bappa Doi is yum, great entry Mallika. Okaey dokey, time for me to say Adios to you until May, take care and enjoy the Spring. More than the post, the title set me off, and I can’t stop. To what consistency did you crush the cardamom? and loved this low fat recipe… is it really just 6 gm per serving? ah!!! guilt free indulgence. Wow…this looks delicious!!! And its so easy to make.Is this something like sandesh? Wow!! Bhapa doi is one of my favorite desserts..no idea it was this easy to make! Will definitely try this one..thanks!! Great recipe and easy too.Made it for a dinner party and heard a lot of oohs and aahs!Thanks ever so much.It was actually the photo which prompted me to try them out!!! Heyyyyy Rosie – Lovely surprise! I just mean the milk that the saffron is soaking in. It turns golden and gives the tops of the bhapa doi a lovely colour. Hi tik tiki – another Kolkata gal!! How is life on the mean streets of the City these days? Great to have you visit here and thanks for the home made doi, although I am loathe to recommend it. This is not that kind of blog because I myself struggle to hit the shops for a pot of yogurt, forget about making my own. Any plans to start your blog again – I love it! Hahaha!!! So will u continue the yoga lessons? Bhapa Doi looks awesome! Will try it once my parents visit me as a treat for them! Thanx! You’re too funny!! Just loved the yogi sequence! Will try bhapa doi soon! This recipe is absolutely fantastic. I made it for a dinner with friends last weekend, and everyone loved it. I never had Bhapa Doi growing up because my mom (a single parent with a full-time job) always thought it was crazy hard (at least the way my Dida made it), but your version is so easy! And I love the smoky depth of the roasted cardamom. Thank you! Can this be cooked in a microwave oven? Thanks! Pumba – Nope, because it is slowly steam baked in a conventional oven. You could try a low heat cook and see what happens.